The results of the Newcastle v Arsenal player ratings by fans. In the 3-0 win over Southampton it was Jonjo Shelvey who was Newcastle man of the match in our ratings from Newcastle fans. Then we had Mohamed Diame getting top marks in the 1-0 victory over Huddersfield. At Leicester, it was back to Jonjo Shelvey as he pulled the strings to down Leicester 2-1. Now, you won’t be surprised to learn, we are back wit Mohamed Diame after Sunday’s display. An all-action display sees Diame deservedly getting a collective fan rating of 9.1. In second place come his central midfield partner Jonjo Shelvey with 8.3, sharing that mark with goalcorer Ayoze Perez. Matt Ritchie (8.1) scored the winning goal and is the fourth player to get a rating of over 8.0. Nobody let the side down but no surprise to see all of the back five getting decent marks. Martin Dubravka (7.3) had few saves to make but once again was excellent at dealing with high balls into the box, with the exception of one that he didn’t properly connect with in the second half. Lascelles (7.7) and Lejeune (7.5) once again very good in the middle of defence, with Paul Dummett (7.8) solid and DeAndre Yedlin (7.2) energetic and with an assist for the equaliser. Kenedy (7.3) had a quieter game but came into his own as the game opened up later on, seeing one effort deflected onto the woodwork. The odd man out though is Dwight Gayle (6.6) who is maybe harshly treated as he did well to help create the first goal and his unselfish running in behind was essential to how Rafa wanted to play, with Shelvey dropping the ball over the top. Special mention for sub Islam Slimani (7.6), he was on less than half an hour and looks a right handful. As well as creating the winner, the striker linked play up well and put some clever passes in, including the one where Kenedy came close to scoring. 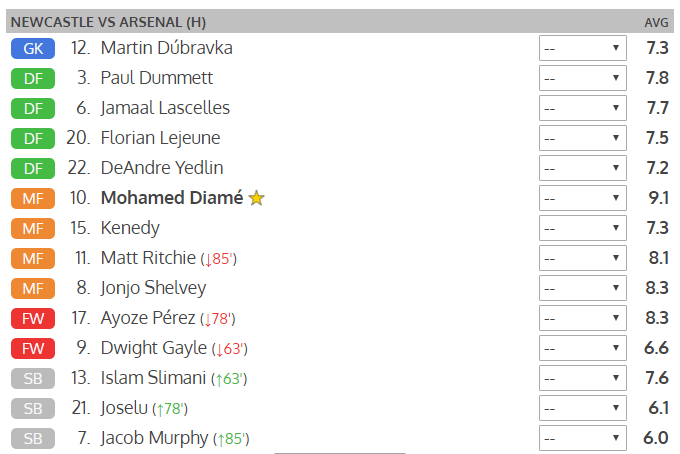 If you haven’t already put in your Newcastle v Arsenal player ratings, go HERE and you can still input your own marks out of 10 for each player, then check back later to see whether the overall interactive ratings have changed for the team as more fans vote.